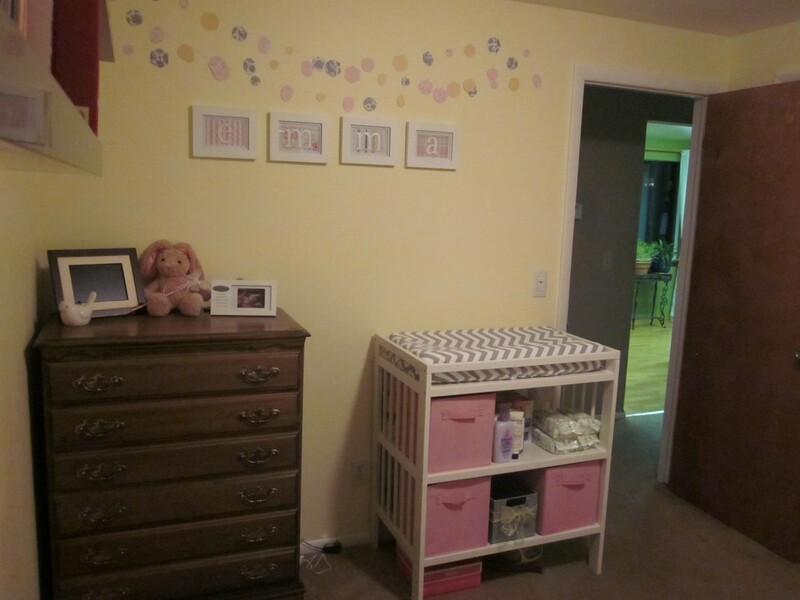 I’m so excited to finally share pictures of the nursery! It’s not completely done – I still have 2 picture frames and the diaper pail coming from Minnesota that I got at my shower, and I still would like to get a small side table for next to the glider, but otherwise, it’s finished. I’m so happy with how it turned out. The glider/recliner is the TRYP of the Best Storytime Series and it is amazingly comfortable for both me and Travis. The crib is the Graco Lauren 4-in-1. 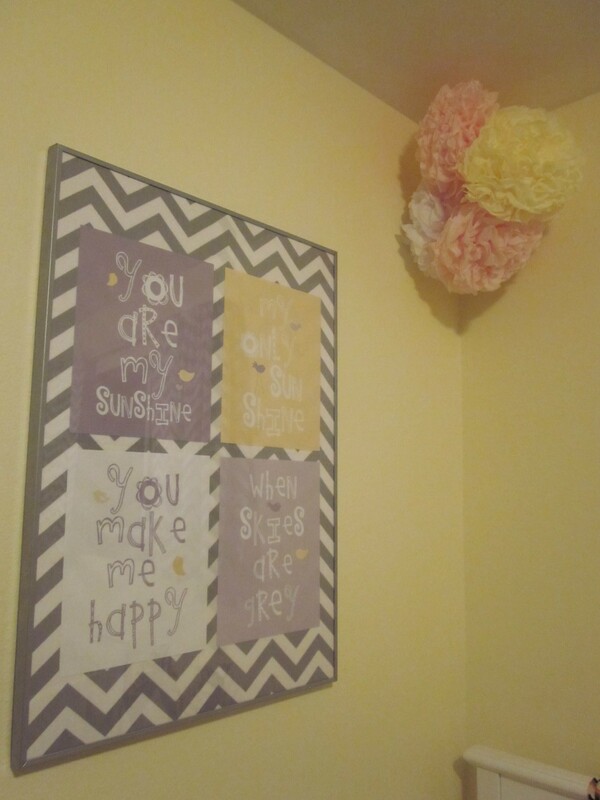 My friend Carrie gave me those adorable etsy prints for my shower gift. I had wanted to use that picture frame for something but couldn’t find a poster the right size. Those prints worked perfectly, and we backed it with some of the extra fabric we had left from the curtains and crib skirt. The tissue paper poms were made by my friends who hosted my shower. 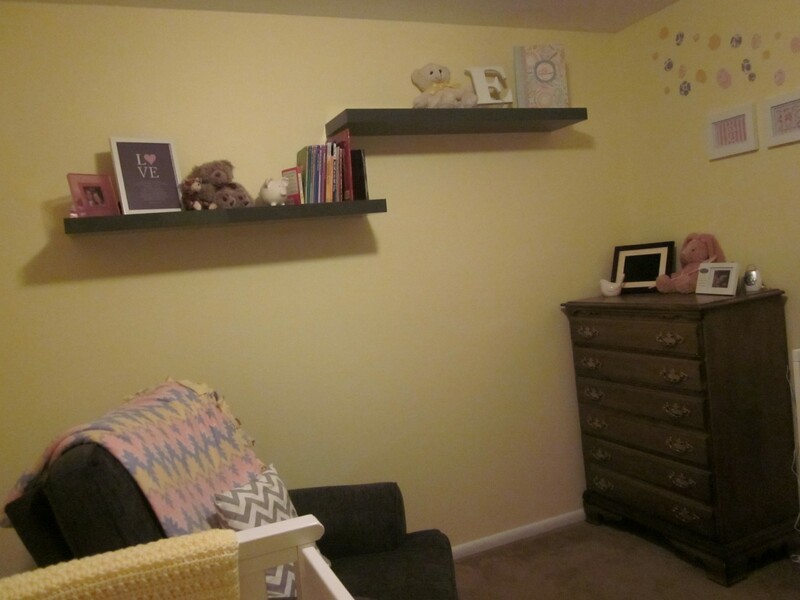 The closet (unpictured) is on that same wall, to the left of the etsy prints. 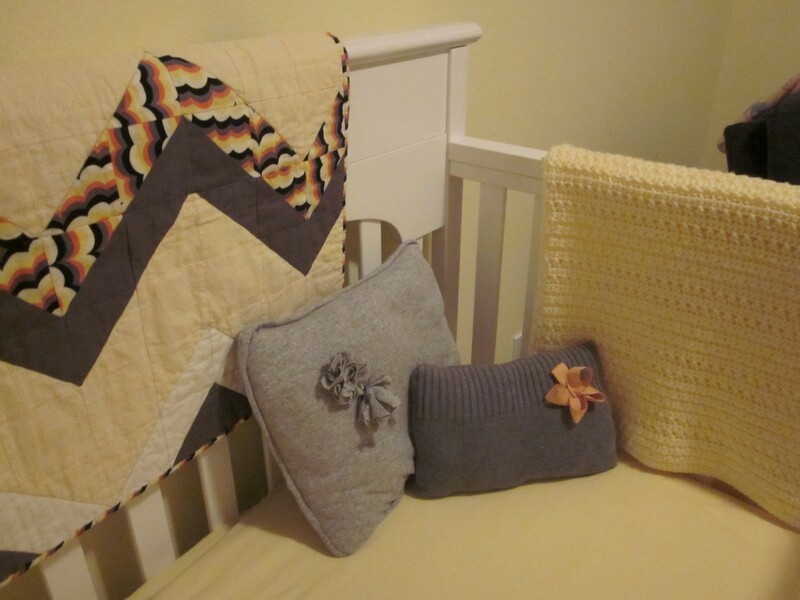 So many amazing homemade baby gifts! All of these were made by friends (except for the sheet). 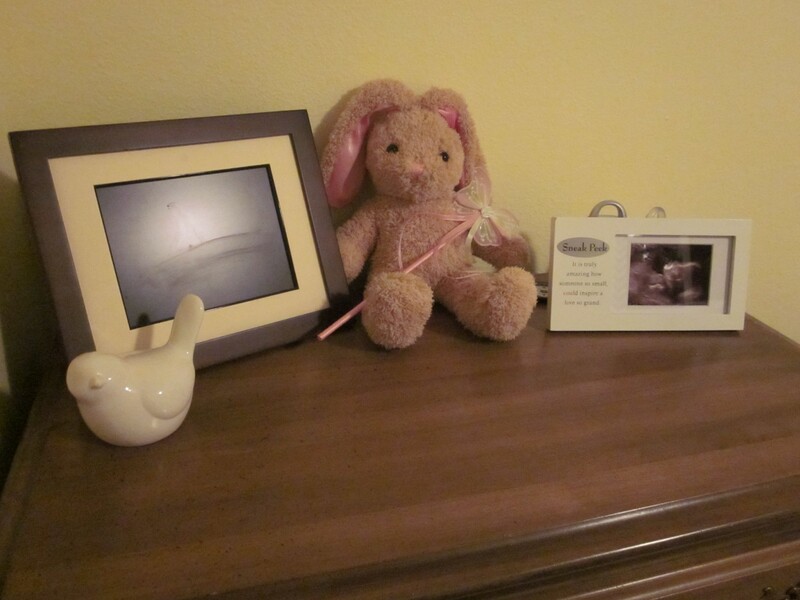 They work perfectly in the nursery. To the right of the crib and glider, we hung our shelves (in high gloss gray) from Ikea. I found the piggy bank and books at the thrift store. I had the pink frame (need to switch the pic out) and bears and made the LOVE print based on an idea I found on etsy (it has Psalm 139:13:18 on it). The bigger bear is very special because I gave it to my grandma (my mom’s mom) in the hospital before she died, so it reminds me of her. 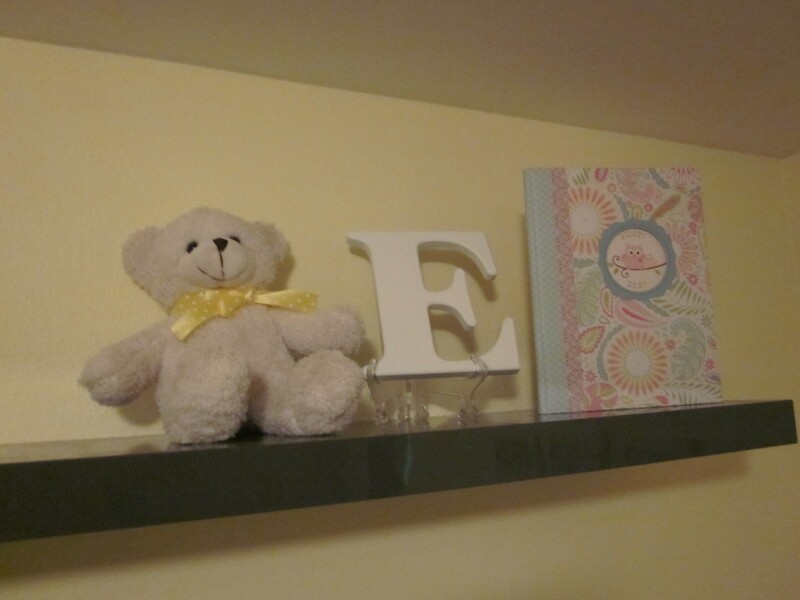 The book on the right is our baby book and the bear is from my Minnesota shower. 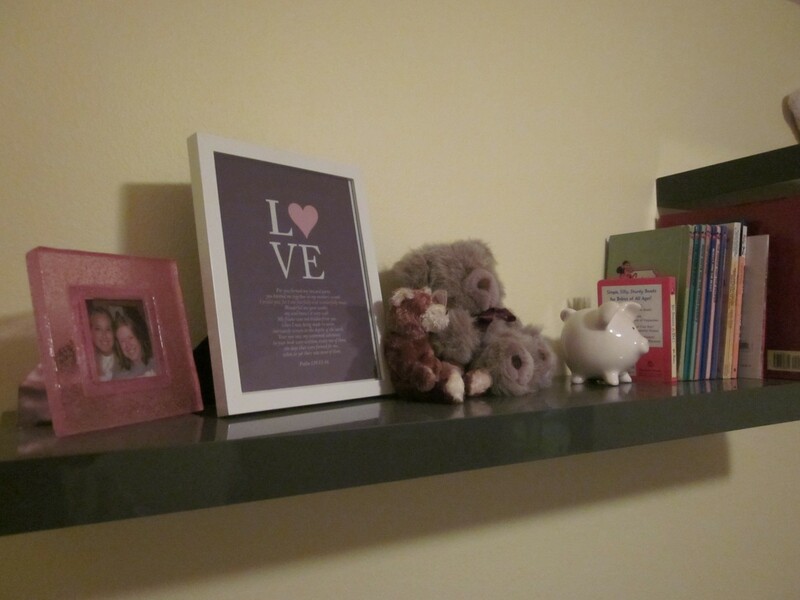 I also plan to put the square picture frame on this shelf and hang the 1st year collage underneath the shelf. 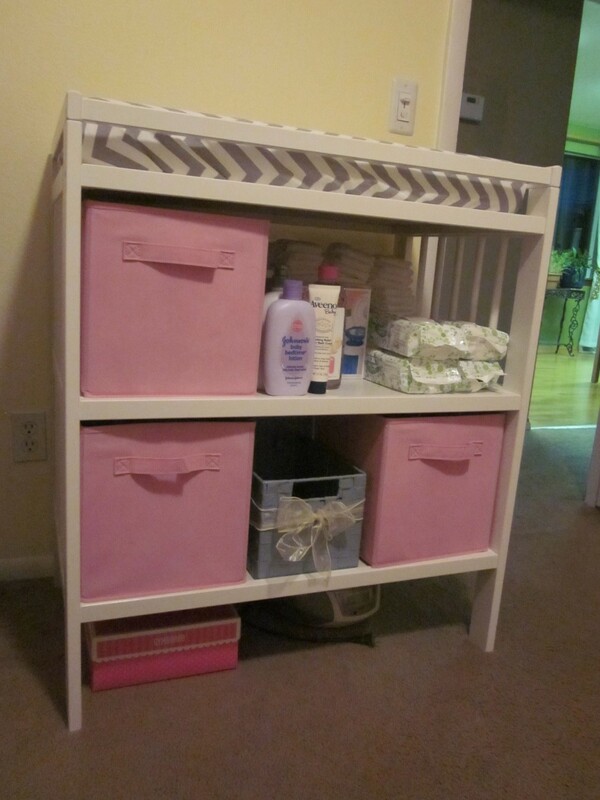 I plan on putting our diaper pail between the dresser and changing table. While the dresser would ideally be white to match the rest of the room, we already had the dresser and didn’t have anywhere to store it, so I let it go. Our changing table is from Ikea. I had planned to put the 3 pink drawers all in a row, but the table isn’t wide enough. This works for now (I’ll probably end up rearranging things later). The top shelf has disposable diapers (loose ones in the drawer) and all diaper changing essentials. The bottom shelf has all of the hygiene supplies, mommy supplies, toys, etc. Underneath is a CD player and a box that holds all of her headbands and barrettes. I found the changing pad cover at the same store as the glider – Firefly Furnishings. 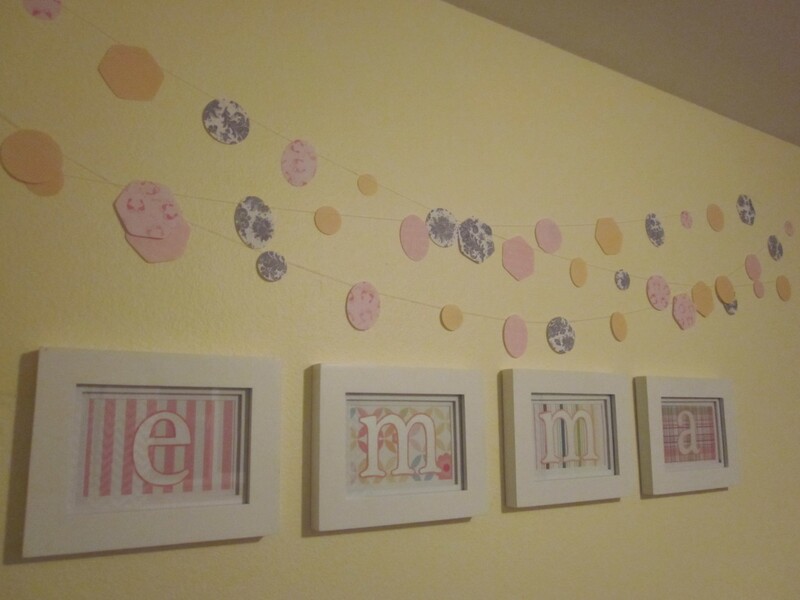 The paper bunting was also made by my friends for my shower – I had wanted to hang some on that wall and what they created was perfect. For Emma’s name, I bought the white frames and scrapbook paper. Then I printed the letters, cut stencils, and traced the letters. It was tedious and I ended up adding a pink background behind the letters after seeing that the white alone didn’t stand out enough, but I like how they turned out. And that’s it! We’re ready for you Emma! Oh my gosh – it is SO cute!! I love it. Nice work!! 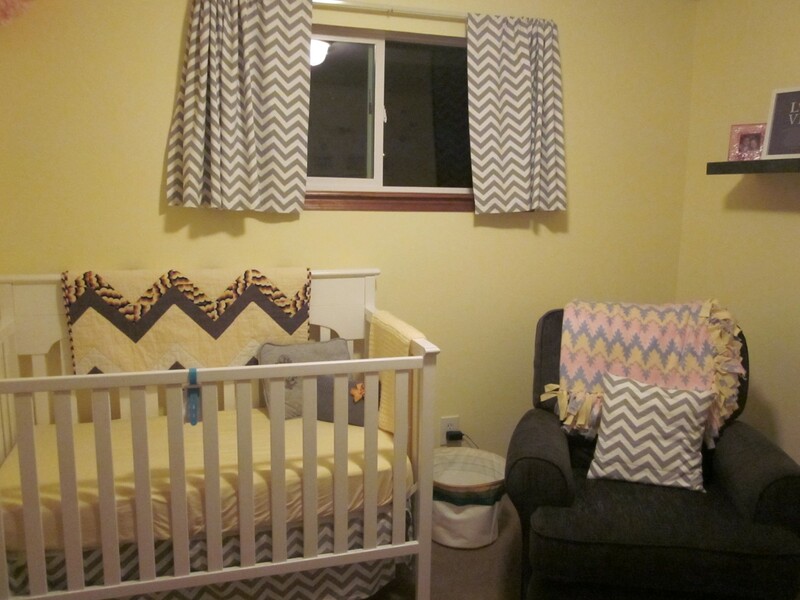 Love the chevron – we are incorporating that into our nursery theme as well! Everything is so cute. Isn’t it so fun to decorate?! 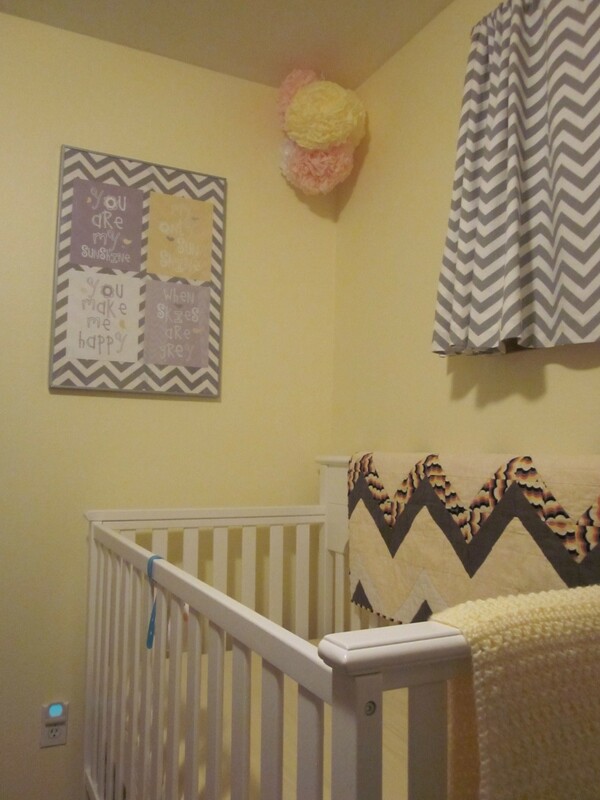 Love the nursery!! 🙂 It’s so pretty! !